RCUniverse.com, RCGroups.com, and other online forums are full of examples of people converting free flight rubber-powered model airplanes to radio control. Modern featherweight airborne R/C system components and tiny, powerful motors makes full-house (rudder, elevator, throttle, and ailerons) possible. 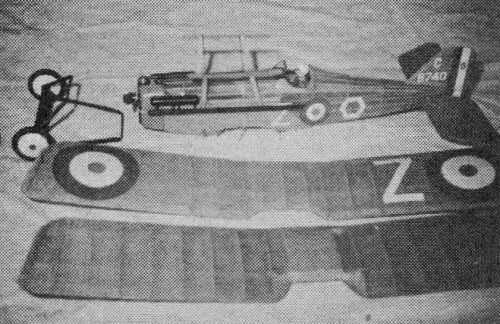 In 1962, however, converting, say, a Guillows SE-5 WWI biplane to R/C meant installing a Cox 020 in the nose and settling for rudder-only control using an escapement system. Escapements saved a little on weight by using a wound rubber band as the mechanical torque driver, but the NiCad or Alkaline batteries were (and are still) heavy as compared to Li-Ion and the vibration of an internal combustion engine wreaks havoc with a stick and tissue airframe. 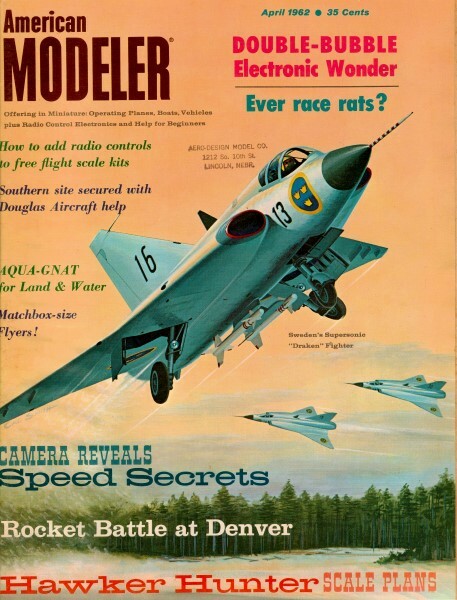 Still, you work with what you've got, and that's exactly what famed modeler Ken Willard did with the subject of this article. Here are a few excellent examples submitted to me by Bill Gaylord. 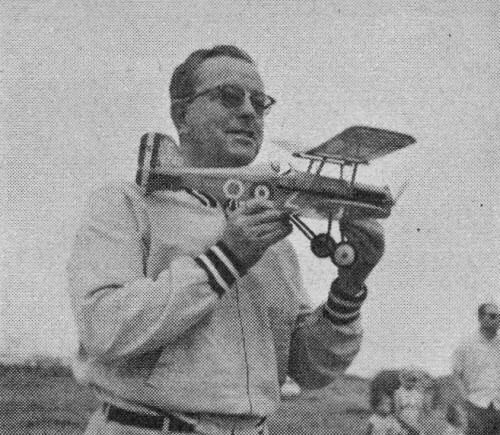 Ken Willard with Guillow's SE-5 R/C conversion. Guillow's SE-5 conversion to R/C. The welcome renewed interest in bulkhead and stringer-type construction for scale models, as advocated by the Guillow's kits for World War I fighters, and more recently in their World War II models, has inspired a lot of us "old-timers" to build them. Since it seems a shame to have to chase them, and even more so not to be able to make them perform the maneuvers for which they became famous, the thing to do is to fit them with a small receiver and modify them for R/C. My all-time favorite of the World War I fighters was the S.E.-5, so I decided to see what had to be done to make it radio controlled with as little changing as possible. You could make sheet balsa tail surfaces, enlarge them a bit maybe, but if you're going to do that you might as well start from scratch ...so I used the structure right out of the box as the basic framework, and added only where absolutely necessary. No changes on the upper wing. Build according to plan. Cut a small notch in trailing edge where cabane ribs fit. This keeps wing rubber from slipping in trailing edge cutout. Build lower wing as per plan, fill in structure from rear spar to trailing edge at center section as shown; sheet over forward part of center section. This added strength is necessary since wings must "knockoff" and this part of wing takes a beating on rough landings. No changes required on horizontal stabilizer. But you need a moveable rudder, so add 1/16 square members as shown, then cut away moveable part after framework is dry. I know - entire rudder really should move, but that introduces more changes. This is an easy compromise and it gives plenty of control. Make up a separate landing gear, with the bracing going up along struts, across fuselage bottom and down other side. With this "knock-off" landing gear held by rubber bands you'll save a lot of minor repair work. It fits in lower wing cradle. This isn't exactly to scale, but the change is hardly noticeable. Use die cut wood from kit, braced with 3/64 wire. Since the gear takes a beating, I used epoxy resin to join wood and wire - it makes a strong bond. Here come the most modifications. 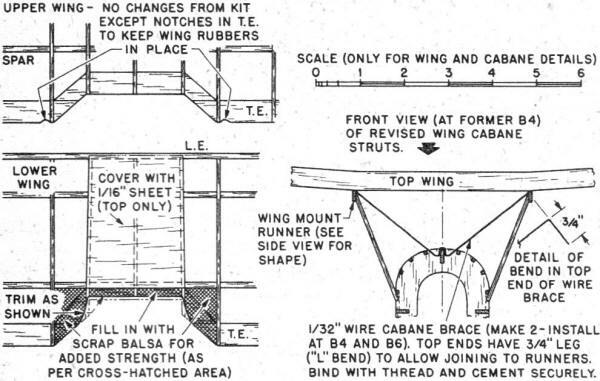 First, the decision to make wings and landing gear "knockoff" means changing cabane structure and lower wing cradle. Next, some provision for radio, escapement, torque rod and escapement rubber is necessary. But it's not so hard - just takes a little time. Finally, due to the added weight, it's a good idea to beef up the forward fuselage with sheeting. Guillow's SE-5 plans modification for radio control installation. 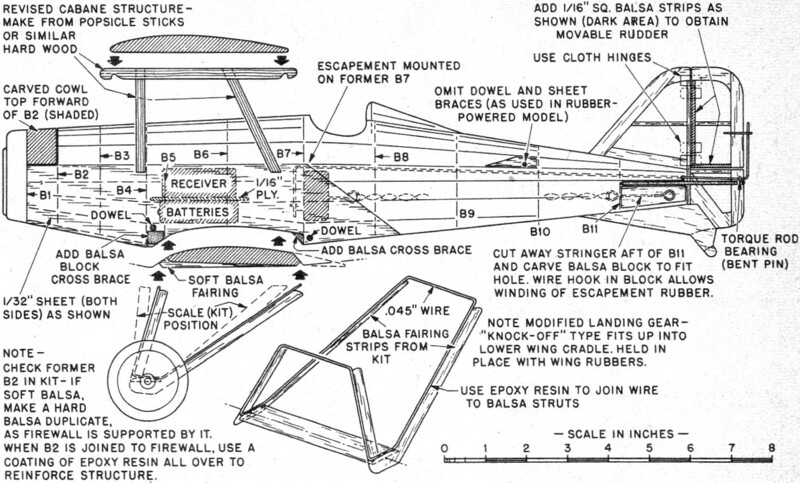 Guillow's SE-5 plans modification for radio control installation - Wing mods. Start by building framework as on the Guillow's plan. Then begin at the nose and make the changes. You can use the engine mounting as shown. However, for easier access, I cut away all structure back to former B2 and then carved a cowl to fit from there forward. By careful carving I was able to fit the plastic nose cowl onto the balsa, then hollowed out the entire cowl block so it would fit around engine and flush to "firewall" former B2. The top has to remain open so you can get at the needle valve and to accommodate the cylinder head which protrudes. If you have one of the newer .020's make a side cutout for the needle valve. You can fly with the cowl removed, but it doesn't look realistic. Be sure that former B2 is a strong grade of wood, otherwise the plywood firewall will be pushed through it on nose-overs. For added strength you paint entire former and plywood engine mount with epoxy resin. Let's make cabane structure. Replace kit wood with "Popsicle" stick wood, cut to same size, then cut additional fore and aft members required for upper wing to rest on. Glue cabane struts to fuselage, using reinforcing blocks provided, add fore and aft members. Be careful here - make sure the two are parallel and at the precise angle shown for required incidence. This is the most important setting so take your time and do it right! After structure is thoroughly dry, beef it up by adding 1/32" wire bracing which comes down and fits over top center keel like the old R.O.G. wire wing-holders used to do. Bond this wire to keel and cabane structure with epoxy resin. With this added wire strength at forward and rear cabane struts, plus a solid glue joint where cabane struts attach to fuselage side, you won't worry about cartwheels and nose-overs (and you'll have them). The modification at lower wing cradle is easy. Just add balsa block cross bracing at leading and trailing edge formers B5 and B7 respectively. Add dowels later - after radio and escapement have been fitted and sides sheeted. Now the part which will vary according to type equipment you have. Escapement should mount on former B7. To do this, first mount escapement on 1/16" plywood. The size will vary, depending on whether you use a Babcock, Citizen-Ship, or Bonner. I use a Bonner. It was necessary to cut off the base ends so that it would fit. Citizen-Ship and Babcock need no modification. Be careful escapement doesn't project at bottom into wing cradle. Cut away former B7 so escapement can fit in fuselage, then glue plywood to former. While it is drying, cut away side stringer on fuselage left side from former B-11 back to tail post, then cut and fit balsa block to go there. Make rubber retaining hook to fit through block, with winding hook on other end. Sight down through fuselage and with an X-acto knife cut inside of formers B-8, 9, 10, and 11 so rubber will pass freely from escapement to rear hook. 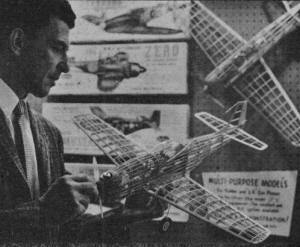 Guillow's designer Lou Andrews with firm's P-51 Mustang free flight for powering with Quarter-A engine. Spanning 27-3/4", takes radio controls in fine style a la S.E.-5 described by Ken Willard. Push 1/32" wire through fuselage from rear to escapement. If it meets any wood on the formers, enlarge hole slightly so wire moves freely when escapement operates. 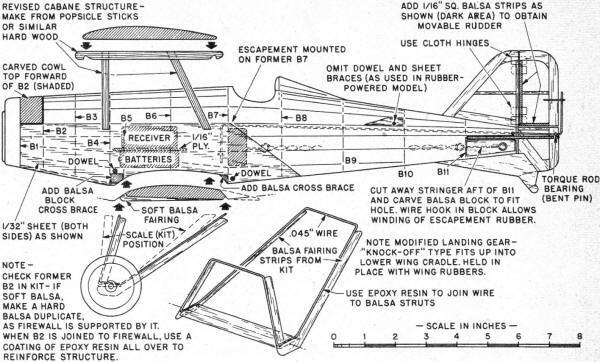 Note rear end of wire is offset slightly to the left so it will rest against left side of rudder lower, which is fixed. Rear bearing for rudder torque wire consists of a U-shaped pin with the head cut off, passed through lower fixed part of rudder at trailing edge. After escapement, rubber, and torque rod are working, remove rubber and torque rod and finish fuselage. Add 1/32" side sheeting over basic framework as shown. Then poke holes through and glue lower wing dowels in place. Radio receiver and batteries fit in fuselage just above lower wing. Make 1/16" plywood base to which you strap your receiver (F&M, Citizen-Ship, or C&S) on one side with rubber bands and two E91 Energizers with solder leads on the other. Fit package through lower wing cradle opening, cut away inside of former B-5 so receiver package butts against back of B-4. Add 1/16" plywood doubler across back of B-4 for strength. To keep receiver package from slipping back and jamming escapement, fit 1/4" square hard balsa retainer in back of receiver and battery mount, glue it to fuselage so that when receiver package is held up in fuselage by lower wing, it also is held forward against B-4 by retainer brace. After you've made all modifications and are ready to cover, you might want to use green-colored silk instead of paper. Well, it makes a pretty model, but take it easy! These models aren't designed to withstand the powerful shrinkage of silk, and you could ruin all your good work by warps. To minimize this, use butyrate dope (which doesn't pull as tight as nitrate) and plasticize it with castor oil. "Originally we transported it this way because it was too big to fit into the car. First thing we knew, we got an F.A.I. certificate in the mail for setting a new R/C distance record!" Make a light framework, similar to your model, cover it, let it dry. If it tightens up without warping, you can proceed with your covering and doping. If it warps - add a little more castor oil to the dope. If the covering sags even when dry, reduce the amount of castor oil. For a starter, try four drops to the ounce. Finally, make the interplane struts removable, and operate without them; otherwise, they'll get knocked around and maybe through your covering on rough landings. The reason I mention nose-overs and rough landings is that the long gear catches in the grass. The model glides well, but the axle bar can trip it up. 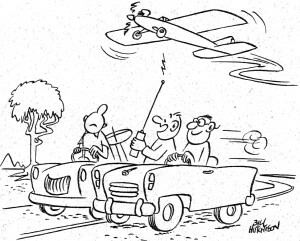 As for flying use the same test procedure as for other models. If you have one of those fields covered with long grass by all means test there. Although I've talked only about the S.E.-5, the same procedures apply to similar models, so pick your favorite F/F Scale and fly it with R/C.